If your home is already connected to your phone, make sure your swimming pool is, too. You can monitor the water temperature, get alerted about filter malfunctions, and control the lighting from your phone. More advanced systems can even let you know if someone is in the pool when they shouldn’t be or give you a camera view of the area. Contemporary architecture is about strong lines and right angles. Instead of a softly sloping pool perimeter, opt for right angles and a stark rectangular design. 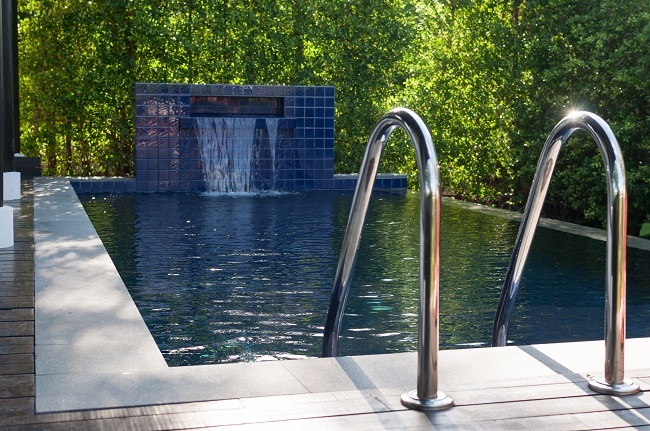 Your pool doesn’t have to have a nylon blue finish. You can add murals, patterns tiles, or even stone-look finishes. Dark and complexly patterned tiles are becoming more and more popular, and they can be great accents around the edge of a large pool. Another trend that shows no sign of fading is incorporating residential pools with beautiful landscaping features. You can add a waterfall at one edge or have lush rainforest plants along the back. When you’re designing a customer pool, you can make all of the elements of your pool, patio, and yard come together. If you like sunbathing, you’ll love sun shelves. 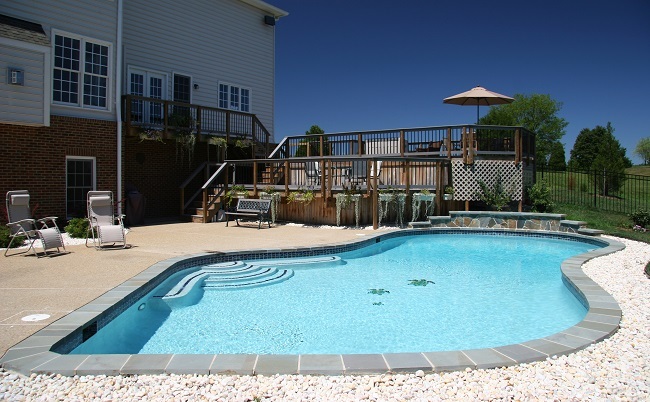 These shallow pool decks sit just a few inches in the water so you can enjoy both the cool water and sunbathing at once. If you build them next to a below-ground outdoor kitchen, they can also double as fun seating by the counter. Browse our gallery at Varsity Pools for more design elements that will turn your backyard into the oasis you’ve been dreaming up. Spring is approaching and now is the time to plan renovations for your yard. One way to greatly improve your outdoor space and make it more useful for your family is to install an outdoor kitchen. This outdoor living trend keeps growing each year, thanks to new innovations in materials, better technology and clever new features. Here are three trends to consider when designing your new space. Over the past few years manufacturers of outdoor furniture and accessories have made great improvements in both design and weather proofing. You can now install an outdoor sofa or soft chairs in your outdoor kitchen without fear of them getting moldy or sun bleached. Because of this, the latest trend is to match your outdoor kitchen or patio to the decor inside your home. 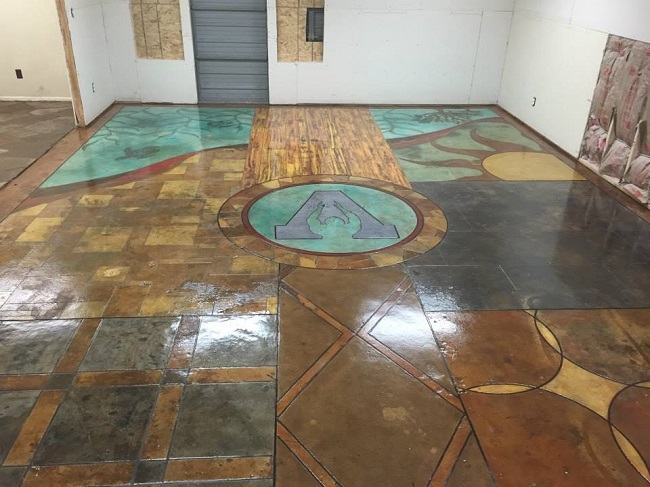 Even the flooring can be customized to match if you choose to install decorative concrete. Or, use granite or stone to follow the shabby chic design trend for outdoor spaces. Gone are the days when outdoor lighting means harsh spotlights that you turn on and off with a switch. Today’s LED lights are far more versatile. Many are solar or motion sensitive, making them both convenient and economical. Use a bright light over a counter in your outdoor kitchen or soft spotlights to gently illuminate a seating area. Small lights along a path from the house to the outdoor kitchen prevent accidents. With an outdoor kitchen, you can have all of the comforts of an indoor kitchen, plus fun things you don’t have room for indoors. Many brands of stainless steel counters, refrigerators and trash drawers are now both durable and weatherproof. 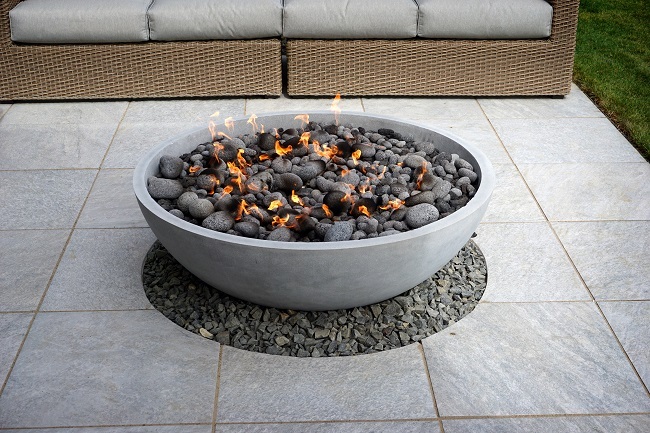 Fire features, such as fire pits and fireplaces, continue to be a big outdoor living trend because they allow homeowners to use their outdoor kitchens more comfortably in cool weather. If you love to cook, a smoker or wood burning oven allows you to explore techniques that you can’t try inside your home. 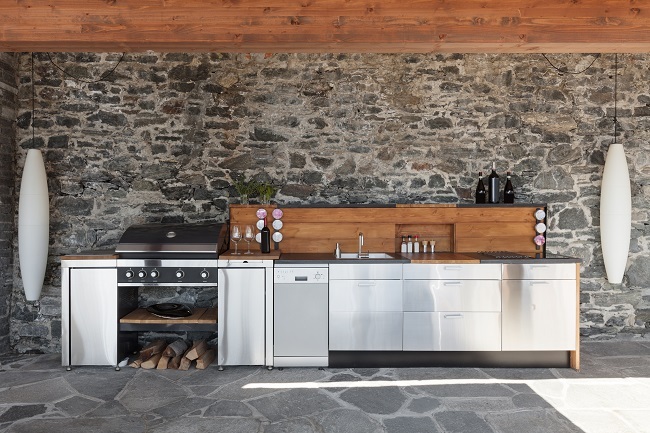 These are just a few of the features you can incorporate into your new outdoor kitchen. Contact us for more information on how to transform your outdoor living space. If you are looking for great ideas to incorporate into an outdoor remodeling project for your home, you’ll want to take a look at all the recent advancements in decorative concrete. No longer are homeowners limited to drab, gray stretches of utilitarian concrete. Now homeowners can select from a wide variety of decorative treatments for outdoor areas such as steps, patios, walking paths, pool lounge areas, and more. Read on to learn more about how decorative concrete can add great style to your outdoor remodeling project. If you’ve always loved the look of brick, tile, slate, flagstone or even wood, but didn’t want the extra expense and upkeep that comes along with special materials, you now have more options. All of these textures are easily replicated through the use of a process known as concrete imprinting, or stamping. You’ll still get all the easy care features of concrete as well as its affordability, along with the textured look you’ve always dreamed of. Whether you are pouring new cement as part of a remodeling project, or have some that simply needs updating, adding texture to concrete is a great way to add beautiful visual interest outdoors. Another great way to incorporate a unique design into any remodeling project is to add color to decorative cement. Today’s concrete projects can include the application of stains or dyes that will provide just the right shade of accent color to outdoor cement surfaces. It’s also possible to use multiple colors that will allow one to create unique decorative cement patterns. Whether you want to add subtle earth-toned color accents that harmonize with the outdoors, or add a punch of bright purple, yellow or orange for that “wow” factor, the choice is yours. If you would like to know more about decorative cement can add style, texture and color to your backyard project, contact us! As a pool owner, one of your most essential tasks is to keep leaves out. Don’t fall prey to any of the following common excuses folks use for not scooping out their pool. While it’s true that a pool cover will protect your investment, it cannot possibly keep out all leaves and debris. Very thin particles can still slip through the space between your cover and the pool. So don’t be surprised to peel back your cover and learn that your pool is not as clean as you would like it. The trees surrounding your pool may no longer have leaves, but that doesn’t mean that other debris won’t wind up in your pool. Pine needles, pine cones, acorns, and other matter could end up there as well. Unless you scoop your pool on a regular basis, you may not have any idea what’s inside it until you are ready to open it up again in spring. #3. A few leaves won’t really hurt anything. I’ll wait until I have lots of them to remove. The truth is that even a few leaves can drastically change the pH balance of your water. This can result in the need for additional chemicals, which ironically will only be soaked up by the leaves. You’re actually just throwing money away if you don’t keep your swimming pool free of debris at all times. To keep your pool in peak condition, you should ideally scoop it every day during swimming season and at least twice a week when not in use. Maybe you would like to spend more time swimming and fewer hours cleaning your pool, in which case we invite you to contact us instead. When the weather outside is beautiful, as it usually is in central Texas, there really is no reason for you to miss out on a place outside of the home that you can enjoy. Backyards are the best place to create a space that is an extension of your life inside the house. You can turn it into anything you want it to be and Varsity Pools can help you with it. There has never been a better time, or a better opportunity to have a professional construct a pool area that is suitable for all your needs. Pools are ideal places to relax. Many people sit for hours on a floating lounge to read or cool off on hot summer days. You can take it to the next level of relaxation by adding new features to an already existing pool or by custom building a pool that meets your needs. Pool lighting is a great way to get ambiance around the pool during the night, but during the daytime they are less noticeable. Why not have stone pillars with umbrellas put into the pool’s shallow end or on the deck so that you can hang a hammock without relying on trees? 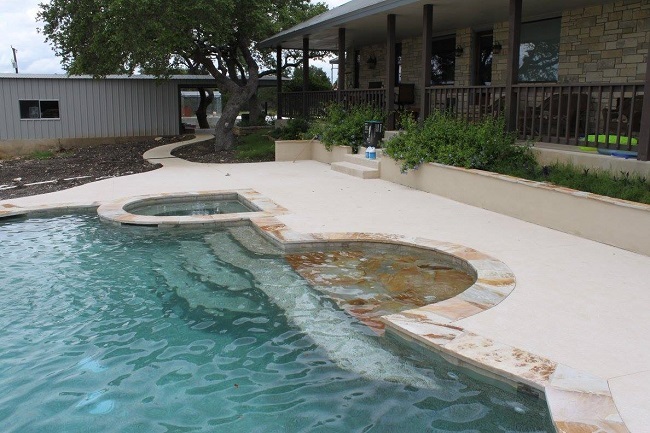 A custom pool designer may be able to put chaise lounges inside of the pool on the shallow end using concrete. For landscaping around the pool, you can add privacy fences, shrubs, and more to block out noise from nearby neighbors or roads. Swimming pool areas are ideal for creating a great party space. If you have a covered area on your patio, hanging lights can make things more fun. Outdoor speakers will allow you have music playing throughout your entire party. An open bar, perhaps built-in near the pool’s edge can give you a place to store beverages and snacks. You can also have the complete outdoor kitchen setup, complete with a nearby fire pit. Imagine being able to sit around the fire pit while eating your tasty feast. To make it kid friendly, you simply need to add in a slide or a diving board. You can also put up a swing nearby if you have the space for it. You may not think of a pool area as a retreat, but with a little effort it can exceed all your expectations. Even if you have a small yard, you can still create the illusion of a hidden paradise. If you are building a pool area from scratch, you may opt to go with a less traditional pool. You can then use landscaping tricks to enhance it. 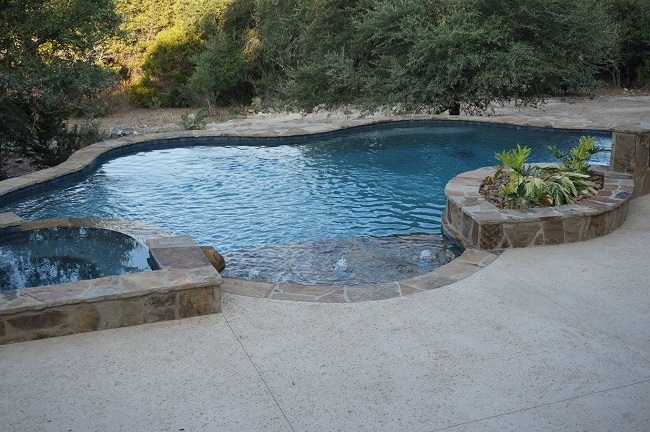 For instance, a small round pool construction that has a rock wall, perhaps with a water feature on one side. You can plant tropical flowers and trees around the wall or perhaps turn it into a unique spice garden. You get to choose what type of pool area you want to create. No matter what type of pool environment you want to design, we are here to help you make your dreams come true. All you have to do is let us know you have a dream to enjoy your backyard to the fullest! 1. Connect your standing hot tub to the pool. Separate water features mean that more people can relax in your backyard. But if you have limited space, then you can’t fit wide margins between the pool, the hot tub, and the patio. Make that work for your design by connecting the hot tub to the pool. By raising the tub, you don’t have to worry about an unclear dividing line. You can also incorporate a waterfall feature to bring it all together. 2. Add an extra lip around the pool. Not everyone who wants to go to the pool wants to be in the pool. But sitting on the edge of the pool can be uncomfortable and make. So choose a pool design that has an extra lip just under the surface of the water for sitting. Not only can more people enjoy the water, that extra step makes it easier for some of your guests to get in and out. 3. Have a seat at the hot tub. When you have a raised hot tub, you have a lot of real estate that can be incorporated into the overall flow of your backyard. Raise and widen the edge so you can add seats around the edge and have a comfortable tabletop surface. When you have more guests than table space, this extra touch makes everyone fit. 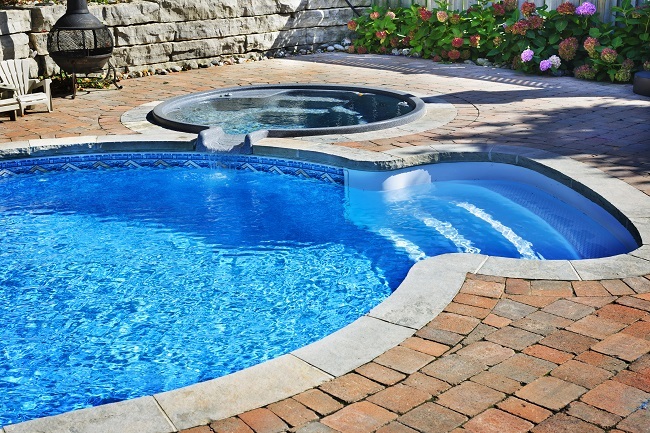 At Varsity Pools & Patios, we can build the pool you’re looking for that’s a perfect fit for your backyard. Browse our gallery or schedule an appointment by contacting us here. Swimming is one of the best types of exercise for men, women, and children, offering benefits for both mental and physical health. Swimming is a low impact, highly aerobic form of exercise, and burns lots of calories. It also increases your heart rate, tones your muscles, and helps you manage your weight. Below we have listed 11 reasons why you need a swimming pool. Swimming is a whole-body workout. While you swim, you are working every major muscle group in your body, including your arms, torso, legs, and stomach. Swimming increases your heart rate. Your heart rate will increase to healthy levels without added stress to your body while in the pool. Swimming makes you stronger. Spending time in the pool enhances your overall fitness, while improving your body strength. Swimming helps manage your weight. You’ll burn lots of calories in the pool, which will help keep your weight under control or assist in weight loss. Swimming will burn between 413 and 931 calories per hour, depending on your current weight, and your workout intensity. These calorie counts are comparable to more intense and impactful exercises like running or cycling. Swimming is safer than other forms of exercise. A serious advantage for swimmers is that they suffer an injury during exercise at a lot lower rate than runners or cyclists. One easy way to prove this is with a study that compared injuries incurred during the running, cycling, and swimming parts of a triathlon. Injuries during running were 50 percent, 43 percent during cycling, and just 7 percent as a result of swimming. Swimming tones your muscles. Especially when it comes to your upper body and your legs, not much beats swimming for a lean and toned look. Swimming is great exercise at any age. From young children to senior citizens, swimming is a great way to stay in shape regardless of your age and beginning fitness level. You can swim at a pace that is comfortable for you until your fitness level allows you to advance. Swimming builds cardiovascular strength. Cardiovascular, or cardio, exercise, involves your heart, lungs, and circulatory system and is key to overall health. In fact, research shows that regular swimmer’s mortality rate is half that of people who are inactive. Plus, a 2016 study indicated lower blood pressure and blood sugar were the results of regular swimming. Swimming can be a lifesaving skill. Aside from the mental and physical benefits of swimming, it can also be a truly life-saving ability to have when needed. Swimming is a great rehab activity for people with injuries. For those people with knee or other joint issues, like arthritis, swimming can be great as a rehabilitation exercise. Water supports your muscles gently while allowing you to work them harder than if on land. It’s just fun! Swimming is more social and more fun than jogging, biking, or weight lifting, but gives you just as good a workout. Plus, pool parties are the best parties in Texas! If you are looking for a high-quality custom swimming pool that is durable and adds value to your property, choose Varsity Swimming Pools. Varsity will create the backyard oasis that suits your home and your lifestyle. Call us today at 210-559-9553 so we can show you why Varsity Pools is the premier pool company of San Antonio and South Texas.